One of the Artifactio artisans happily starting the process of creating a Thai rice box! Give me a minute and allow me to tell you about my experience with Thai rice boxes! Isn’t it astonishing how you can live in a place and think you know everything about it but then discover that you really don’t? You grow to believe that you understand the people, their culture and their rhythms of life. You’ve really seen it all. You believe that you can “read” the streets and pick up on finer nuances that eluded you when you first arrived. But then you discover something completely new, something previously unknown, that leads you to question just how well you knew this place after-all! This is how I felt when, after living in Thailand for 6 years, I first came across Thai rice boxes whilst walking through an artisans village in northern Thailand. Needless to say to say, I loved them immediately. 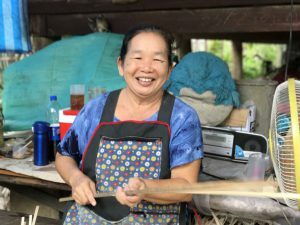 I will admit that I was almost relieved to see recent blog posts by other expats, who have lived in Thailand for as long as 12 years, who had also never seen or heard of the Thai rice box! So obviously Asian, beautifully hand-crafted and hand-painted and each unique. They appear fragile from afar but upon touching them you soon realize that they are in fact very, very robust. Versatile in their use as storage baskets or decorative items to add a distinctive Asian accent to any room. So how are Thai rice boxes actually made? Firstly off, to my best knowledge, there simply is no way to mass-produce these beautiful items by machine. Each of these thai rice boxes is painstakingly assembled by hand, hand-painted and treated over the course of several days. Throughout this process the artisans, who have learn their craft over several years, do not take any measurements or use any templates. Each of these items are truly unique in its shape, size and design. In a world of mass machine production, I personally feel this just makes these artifacts even more unique and special. This is also why they are a cornerstone product for us at Artifactio.com. 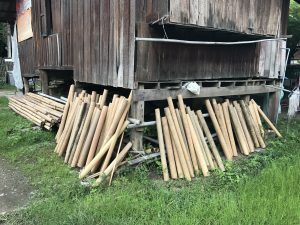 The bamboo arrives in bulk from Phrae in northern Thailand. 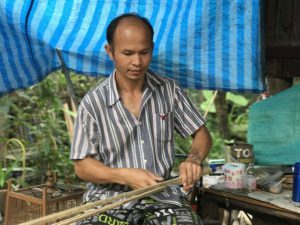 One of our favorite raw materials and of notable economic and cultural significance in Southeast Asia, bamboo is used used for building materials, as a food source, and as a versatile raw product for a variety of items. One of nature’s most impressive raw materials, Bamboo has a higher specific compressive strength than wood, brick, or concrete and a specific tensile strength that rivals steel. The bamboo used for our selection of beautiful rice boxes for example, is harvested in Phrae, in northern Thailand. The bamboo is cut into ever smaller, ever thinner strips. The production process starts with long thin strips of bamboo that are skillfully woven into a square to create the base of what will ultimately become the rice box. The bamboo is then gently sprayed with water to make it malleable so that it can be bent to create the overall structure of the rice box. A similar process is followed to create a matching lid. Incidentally, the bamboo is not treated chemically in any way and therefore does not contain any toxins – good considering it’s a food container! The woven bamboo structure is then covered by hand with chalk, a layer of glue and sawdust and allowed to dry for two day. This makes it as hard as clay and very robust. The Thai artisan then carefully applies two base coats of white acrylic paint by hand on a manually operated turntable. It is at this stage that the real artistic phase starts as the artisan draws the design outline by hand (freehand, using no templates!). Using a variety of colors, the artisan hand-paints the final design that makes each product unique. Again, throughout this process the artisan makes no measurements, used no templates or even nails – instead they use their experience and artistic intuition to create these beautiful and unique products. This process has been handed down from generation to generation, taught from mother to daughter and father to son. In many cases, entire villages are engaged in the process with different families focusing on different parts of the production process. This of course means that the final end-product is not the product of a single artisan but that of an entire village! If you’d like to see a quirky but great video on the entire production process, take a look here! What varieties do the rice boxes come in? There is not end to the variety of sizes and shapes of these beautiful rice boxes! The boxes themselves come in a wide variety of sizes, ranging from very small (capable of holding maybe 100 grams of rice) to extremely large. The largest one I recently saw was capable of holding several large bags of rice – and would even have been an ideal hiding place for a small children’s game of hide and seek! They also vary greatly in shape – the most common appears to be cylindrical but there are also beautifully elongated or almost round boxes. The design obviously vary greatly and no two thai rice boxes are the same. My favorite are the floral and ethnic designs. So do however also feature images of Buddha and Buddhist inscriptions. What are Thai rice boxes actually used for? Being a practically oriented person, the other thing I love about these boxes is their versatility. 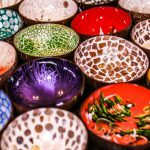 Since seeing the first ones in Chiang Mai, Thailand I have seen them used in many households as decorative items or in very practical ways. My mom for example now likes to put her kitchen utensils in two of them lined up near the stove and also likes to keep her spare change of coins in one. Another innovative and decorative use to use them as the base for table lamps. These come in a variety of sizes and with different lamp shades and sizes. Thai rice boxes – a decorative and convenient storage place to park your Star Destroyer! As a father of three rambunctious kids, I also appreciate easy-to-use and robust storage containers for loose toys, markers and Lego. Thai rice boxes are great for just this use and they look fabulous in a kid’s room! 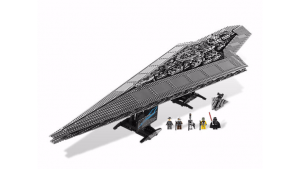 My younger son has the entire Lego Star Wars Super Star Destroyer neatly packed away in one of the large rice boxes. They also act as a constant reminder to my daughter (who loves sticky rice from Thailand) that we need to go eat her favorite dessert – mango-sticky-rice. 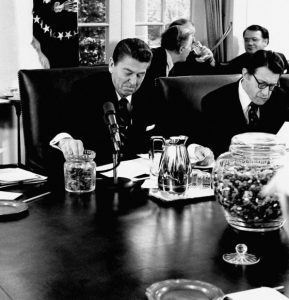 Ronald Reagan enjoying his jelly-beans in the Oval office! For what it’s worth, I personally like to use my rice boxes for my secret stash of cookies or jelly beans (Ronald Reagan would have liked one in the Oval Office I’m sure!). I also love the conversations they spark from visitors to my home who are seemingly as intrigued by them as I was when I first laid eyes on them. It feels good when your home and its contents reflects the journey of your life and places you have visited as opposed to the catalog for a Swedish mass-market outlet. Quite frankly it’s hard to image ever buying any mass-produced, machine pressed or decorated items for my home ever again! This is my first post on these amazing products and I intend sharing more news about them. In upcoming posts I hope to show you how our customers are using these amazing artifacts in real life. See the full range of our beautifully hand-painted rice boxes at Artifactio.com now! Thank you for your very kind comments and order of Thai rice boxes Evelin! We do hope that they will serve to make your home even more beautiful and that they will bring you great joy. We are pleased to have you as a customer and hope to continue serving you in future! 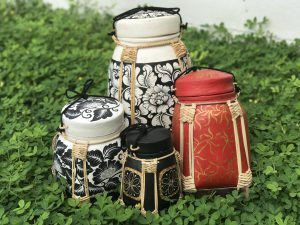 These beautiful rice boxes are simply unique and beautiful. Gorgeous craftsmanship, especially the pattern work. For me this is definitely a great beauty for jewelry or as a flower vast, or simply put it on my working desk. I have got the small ones and I think I will definitely get some more!!! Outstanding designs and unbelievable stories ! I will definetly be ordering plenty of your beautiful products in the near future ! Thank you Hugo, we’re very pleased you liked the post on rice boxes and look forward to receiving your order in future! Look out for more great posts soon!